The SAKURA social housing project in Vienna by the architect Nerma Linsberger for the BWSG group was awarded the American Architecture Prize 2016 and has now also won the German Design Award 2018. The SAKURA social housing project in Vienna by the architect Nerma Linsberger for the BWSG group was awarded the American Architecture Prize 2016 and has now also won the German Design Award 2018. Another recognition for iconic architecture that makes user wellbeing the focal point of the project. The position of the building site on a very busy intersection in Vienna, Austria really conditioned the choices of the architect Nerma Linsberger, who designed a 12,000-square-metre residential building with 53 low-rent apartments. The area of the 2, 3 and 4-bedroom apartments ranges from 62 to 95 square metres and each one has a connection with the outdoors, either onto the walkway or a private patio. A really eye-catching architectural response to the needs of the client, the BSWG group, established early last century as a building cooperative for subsidised housing and in the post-war period growing into one of Austria's leading social housing companies: Nerma Linsberger opted for design solutions that protect the privacy of the occupants, facilitate their interaction and at the same time make the complex itself a standout building in its exposed position. 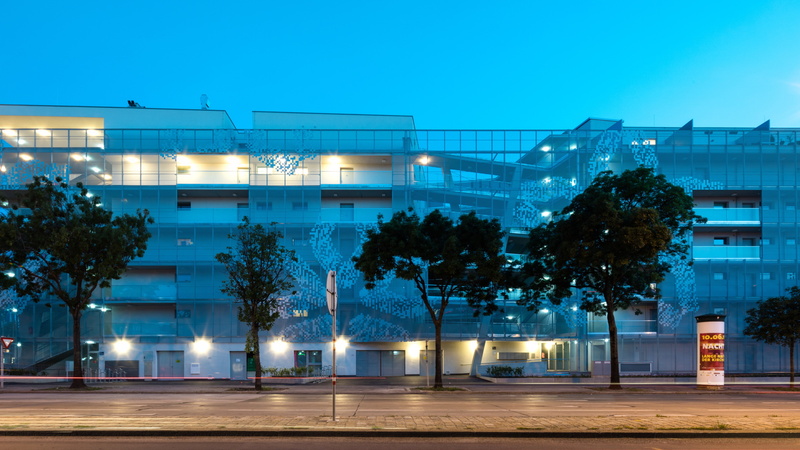 The side of the building facing the street has a steel mesh skin with a floral pattern, which acts as a filter between the road and the homes and is a distinguishing feature of the work. This visual perforation comes from openings in the skin that show us a glimpse of the building with its V-shaped courtyard that divides the block and lightens it up. The courtyard also accesses an urban park on the eastern side, and the walkways accessing the apartments themselves surround the courtyard. The apartments come in a range of floor plans and can even be joined to create larger units. The community spirit of the Sakura social housing project is emphasised by the offer of shared spaces with some rooms set aside and even a communal kitchen that residents can you use for convivial occasions. With Sakura, Nerma Linsberger has created a residential complex in the social housing category that turns the challenges of a tough site and the user target into an opportunity to craft skilled architectural solutions. Because, in the words of Dostoyevsky, beauty will save the world. This approach was recognised by both the American Architecture Prize 2016 and now also the prestigious German Design Award 2018 in the Excellent Communications Design Architecture category.